In a ceremony at MGM National Harbor June 29, caregiver awardees were cited for their sacrifices in putting their own lives—often their own careers—on hold to care for their loved ones who have returned from active military service with debilitating physical wounds and psychological injuries. Including these latest recipients, the Pillars of Strength Program has awarded a total of 22 scholarships since its inception in 2013 offering free tuition to complete a University of Maryland University College (UMUC) degree. Two past recipients already have graduated, and three more are expected to complete their degrees in the next academic year. Noting UMUC’s 70-year mission of educating American servicemembers and veterans, President Javier Miyares said the scholarships continue the university’s tradition of supporting military families to advance themselves through education. “Seldom do we have an opportunity to reach out and touch lives so directly and so profoundly as we do with the Pillars of Strength scholarship program,” Miyares said. 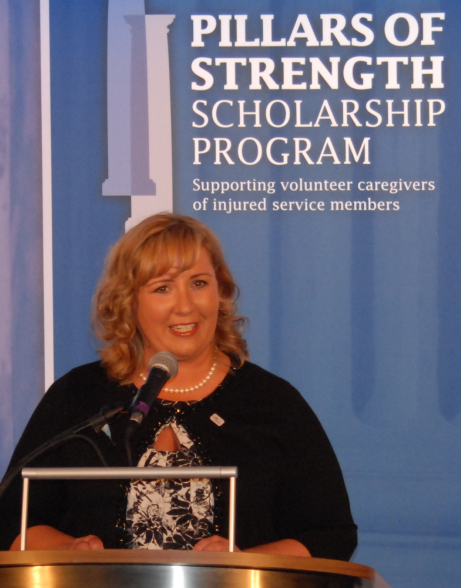 Pillars of Strength scholarships are sponsored by the Blewitt Foundation, the National Military Families Association and UMUC to pay tribute to caregivers who often dedicate themselves to years of tending to the needs of their returning warriors while, at the same time, financially supporting their families. Richard Blewitt, who founded the Blewitt Foundation and created the Pillars of Strength scholarship program, said that six was a record number of awards given in a single year and momentum is building to offer even more. UMUC Alumnus and Maryland businessman David Welch has donated $25,000 to the cause. Baltimore Ravens Representative Chris Wack was on hand at the awards ceremony to pass out Ravens gear and goodie bags to scholarship recipients. The Baltimore Ravens organization has contributed $25,000—one full scholarship—to The Pillars of Strength Scholarship Program fund. And such organizations as the Purdue Foundation, Washington Nationals and Washington Redskins are contributing, too, Blewitt said. In her remarks during the ceremony, Knoefler recounted that she first met her husband, Curtis, when they were in high school in 1986 and they became best friends. But each went their separate ways. Curtis joined the Army. They both married others and raised families. Knoefler said she dropped out of nursing school to follow her husband’s career and became a full-time church and community volunteer. When Curtis was shot in the chest by an Iraqi sniper, he returned home on life support. His marriage fell apart just as Knoefler’s marriage was collapsing. The two reunited to share each other’s troubles, she said. 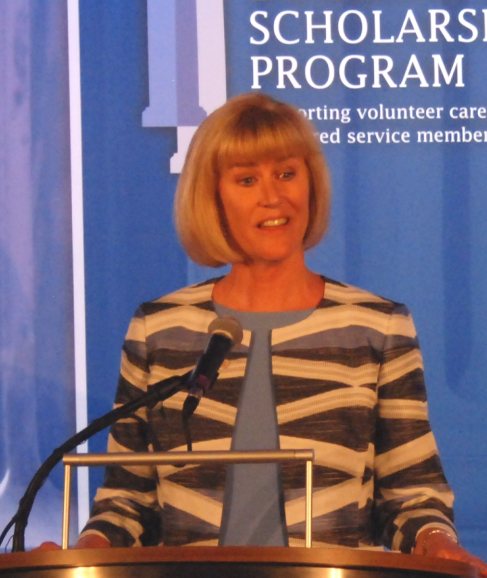 Like many volunteer caregivers, Knoefler receives a small federal stipend for her work. But the stipend is becoming harder to get, she said, and many caregivers fear it will disappear altogether, making it even more difficult to support a family. Knoefler said she wanted to return to her life as a professional in community service. But all of her job applications ended in rejection because she did not have a college degree. So she took out the college loans necessary to graduate from a community college with a double major in social work and psychology. But the student debt was straining her relationship with Curtis. She plans to augment her skills by completing a UMUC degree in communications. Kelly Wilmeth, UMUC’s Vice President of Stateside Military Operations, oversees the scholarship selection process. 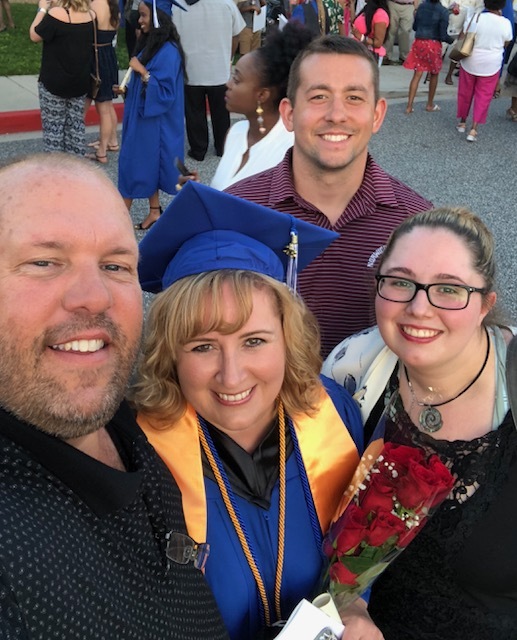 Working closely with the National Military Family Association, Wilmeth spreads the word among members of the caregiver community that they can apply for these scholarships between November and March. “Reviewing the applications is heartbreaking but also inspirational in seeing the sacrifices they have made and their determination to improve their lives through education and their continued desire to give back to their communities,” she said. Sasha Dunne was six months pregnant when her husband, Colin, was discharged from the Marine Corps suffering from severe post-traumatic stress disorder. She is hoping to complete a bachelor’s degree that will open the door to non-profit management. Marie Gibson, whose husband was medivacked to Walter Reed National Military Medical Center in January 2016 suffering from ulcerative colitis with complicated perianal abscess and other inflammatory diseases. As he is about to go off active duty status, Gibson has to find a way to support him and their three children. The scholarship will help her complete a degree to meet her goal of becoming a nurse with a psychology background. 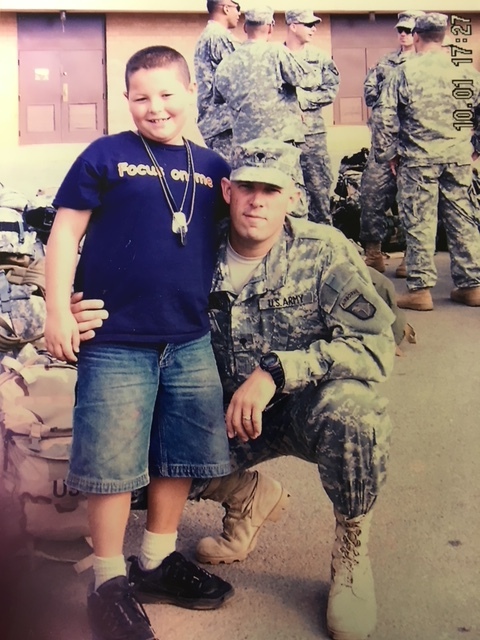 Amberlynn Heffron’s husband had refused to admit how badly he had been injured during three deployments in Iraq and Afghanistan. After a final injury in 2016, he had to concede, and he returned home with a host of problems, including PTSD. Seeing so many veterans aging before their time, Heffron said she plans to use the money for a degree in geriatric studies. Maggie Keelty was raising three children when her Marine Corps husband returned from Okinawa diagnosed with pituitary macroadenoma. She is planning on getting an MBA so she can compete in the business world. Lauren Warner gave up her own Army career to be a full-time caregiver for her husband, who is suffering from daily seizures stemming from a traumatic brain injury. She is seeking an MBA that can allow her to open her own business at home while continuing to provide for husband’s care. 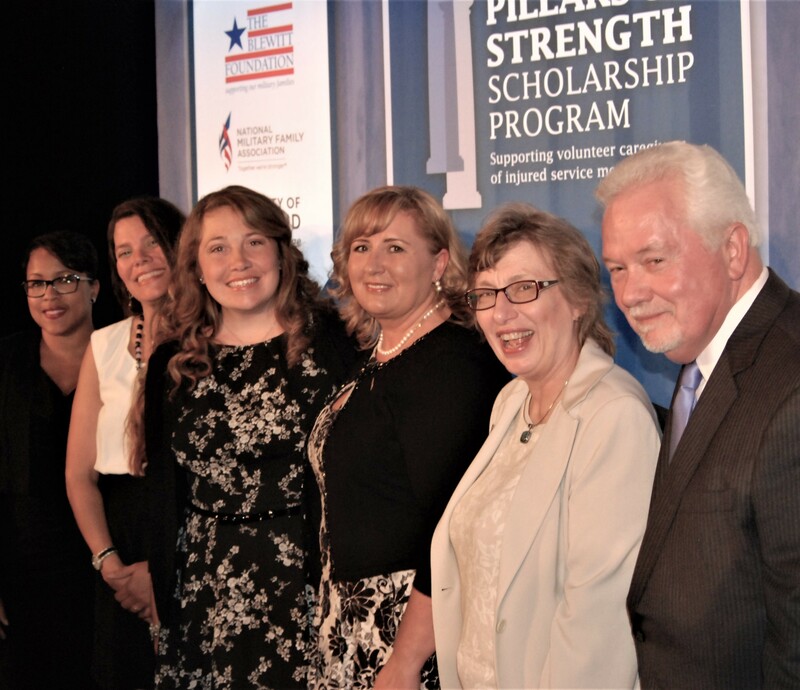 Photo left: Pillars of Strength Scholarship recipients (from left) Amberlynn Heffron, Maggie Keelty and Justina Knoefler with National Military Families Association Executive Director Joyce Wessel Raezer and The Blewitt Foundation Founder Richard Blewitt. Photo top Right: (from left) Starlet Hunter, who leads MGM National Harbor’s community engagement, with Pillars of Strength Scholarship recipients Amberlynn Heffron, Maggie Keelty and Justina Knoefler. Photo bottom right: (from left) UMUC President Javier Miyares, recipients Amberlynn Heffron, Maggie Keelty and Justina Knoefler, and Baltimore Ravens Representative Chris Wack, who supplied awardees with goodie bags and Ravens gear. The Baltimore Ravens organization has contributed $25,000 to The Pillars of Strength Scholarship Program fund. The Blewitt Foundation supports military families experiencing severe injuries and invites financial support to assist the foundation in carrying out its mission for special men and women who are suffering—and who, with their families, have sacrificed so much for all of us. Our mission is based on the belief that military family members serve, as well. A pioneer in distance education since 1947, University of Maryland University College is a world leader in innovative education models, with award-winning online programs in workforce-relevant areas such as cybersecurity, biotechnology, data analytics, and information technology. UMUC offers open access with a global footprint and a specific mission—to meet the learning needs of adult students whose responsibilities often include jobs, families, and military service. Today, UMUC is harnessing the power of learning science and technology to deliver high-quality education that is accessible, affordable, and valued. UMUC is a constituent institution of the University System of Maryland (USM) and governed by the USM Board of Regents. UMUC was #1 in Military Times’ 2018 Best for Vets ranking of online and non-traditional schools. Located in an unrivaled setting, MGM National Harbor offers stunning panoramic views of the eastern shore of the Potomac River in Maryland. The $1.4 billion LEED® Gold Certified resort, which opened December 8, 2016, sits a short distance from Washington, D.C. to the north and historic sites, including George Washington’s Mount Vernon estate across the river in Virginia. The 24-story, 308-room resort features premier amenities and experiences for locals as well as visitors from around the world including a dynamic casino with over 125,000 square feet of space that includes slots, table games and poker; a world-class spa and salon; an entertainment theater with flexible seating for up to 3,000; high-end branded retail; 50,000 square feet of meeting space; and restaurants from renowned local, national and international chefs. MGM National Harbor is owned by MGM Resorts International (NYSE: MGM). For more information, visit mgmnationalharbor.com.